Have you ever had a time when budgeting just frustrates you? Ok slow down, not so many hands in the air at the same time, please :-). 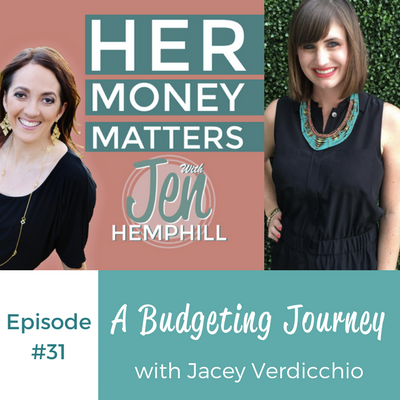 Today’s guest Jacey Verdicchio shares such a great story on her journey with budgeting. Not only that she also shares how she overcame the frustrations that came with it and changed things for the better (plus she shares how they paid off their student debt loans as well). Lots of good stuff in this episode! I challenge you to reflect on the times that you started a budget and didn’t work and ask yourself why it didn’t work? Be sure to let us know in the comment section below! [0:00:27] JH: Hey, hey, this is Jen. Welcome to the first episode of 2016. Happy New Year. Today I have a special guest, her name is Jacey Verdicchio and she shares such a genuine and such a real story that I know firsthand you will appreciate. In today’s episode, Jacey shares a personal story and how they lived on student debt. I am not kidding you, that was their income so to speak and what they did to turn it all around, what she learned about budgeting through the multiple times of disappointment in doing them and she also shares what making giving a priority especially during the hard times did for them and what they learned about that. So let me share with you a little bit about Jacey. She co-hosts and produces a podcast called Around The Table, that is the perfect balance of intention and indulgence. She also works as the brand and business manager for Nap Time Diaries and also Rise. She lives in Charleston, South Carolina with her husband and a golden retriever. So let’s not delay and let’s go ahead and meet Jacey. 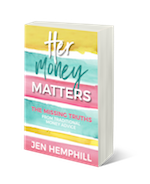 [0:01:47] JH: Welcome Jacey to the Her Money Matters Podcast. I am so happy to have you here. [0:01:53] JV: Thank you so much for having me. [0:01:55] JH: Well it’s exciting to have another podcaster and as I mentioned, I haven’t listened yet to your podcast but I’ve heard so much about your podcast called Around The Table, so I am looking forward to listening to your podcast. But I want to know more about you. I know you’re a podcaster, you’re a brand and business manager, you write as well but I want to know more about you on the personal side so tell us more about that. [0:02:25] JV: Yeah, great. I love in Charleston, South Carolina with my husband Mike and our golden retriever, Jack, who’s like our little baby and I work for a small business here. I blog sometimes, I have a podcast, I love to have people in my home, and I love to read. I’m a big reader just for fun, I love to read novels and I like to run and do yoga and I love eating cookies. [0:03:05] JH: Well, that’s one thing I noticed about your podcast is how you still can have the desserts, you say something along those lines. How to indulge. [0:03:25] JH: Yes, that’s what it is and I’m like, “Oh, I’m game on that”. [0:03:31] JV: Yeah, for sure. [0:03:34] JH: Well, that’s great and then I wanted to know about, of course this podcast is all about money, so tell me a little bit more about how you grew up around money. [0:03:46] JV: Sure, I was really fortunate because my parents really took it upon themselves to teach me about money from a pretty young age. My dad had learned a lot as a young adult about investing and saving and as he learned this as an adult, he really wanted us to be able to take that on at a younger age. And so one example would be when I had my first job, 15, 16, my dad said, “Look, if you will put away half of what you earn, half your paycheck, I will match it into a Roth IRA for you.” Because you can put however much you have reported income, you can put into a Roth IRA. Well I mean there’s a limit but for me, I wasn’t earning that much. I was just a 16 year old with a part time job. So the amount that I earn, I could really put legally a 100% of that in but he wanted me to be able to have money to go to the movies and buy clothes and buy makeup, all the things that I wanted to spend my money on but he said, “If you’ll start this early,” and he would show me on the calculator the power of compound interest. [0:05:13] JH: Compound interest, yeah. [0:05:14] JV: The younger you start, the years that it’s in there makes such a difference even if you’re putting in smaller amounts. And so I have lessons like that from a really young age. He set up a Charles Schwab Brokerage account for me and so I would often give money, you know my grandma would give me money for my birthday or something and I would just give it to my dad to invest for me. So I felt pretty fortunate to have that awareness that your money can work for you from a really young age but what I didn’t quite learn not because they didn’t teach me the importance of it but I think you really have to learn it practically by doing it is how to budget and it took me some learning and some bumps in the road and more frustrating type of learning in my young adulthood I think, to learn how to live on a budget and do all of that just the more practical day to day money stuff. [0:06:16] JH: Right, well tell us, if you could, a little about that because you said that was what you didn’t learn and that’s what you were learning by doing and by maybe making mistakes and so forth. So tell us maybe a little bit about that? The challenges that you had. [0:06:32] JV: Sure, so when I was in college, I still was pretty much supported by my parents. They were generous enough to pay for my school and then they also paid my expenses and I worked but it’s was the same as I was in high school. I worked and then I had that money to either invest or spend and I learned about Mint.com which you are probably familiar with and I actually use it to this day. It was really convenient because I could link my bank account to it and it would track all my debit card purchases but I’d never use it as a budgeting tool. I never actually went in and set up a budget. I would just be going in after the fact and seeing what I had spent, which wasn’t really a problem when I was in college because it’s not like I was over drafting or anything like that. But I also didn’t really have to worry about my actual expenses because my parents were paying for my books and my car insurance and my rent and everything. The stakes weren’t high enough for me to care really and then once I got out of college, I got married fairly soon after being out of college and it was a completely different situation. Where my husband was a student full time in grad school and had some student loans and I had just moved to a new place where he was going to school and was job searching and all of a sudden, it was our “income” was actually from a student loan. It wasn’t actual income for those first few months of marriage and I was kind of doing the same thing that I had done in college, except I was attempting to make a budget at that point. So I would go into Mint and I would set up all these different things that we’re going to spend this much on gas or we can spend this much on groceries. But then still, it would be the end of the month and I’d be looking and seeing, “Oh, we went over on this, we went over on this, we went over on this,” which was doubly discouraging because it wasn’t actual money. So it’s not like I would say, “I think we can maybe get by with this amount on groceries,” which was all debt basically and then we would go over it. If we went over that, it was just not that we were going over and dipping into savings or something, it was like we are already extending even further into debt when we would go over. So it was frustrating on a lot of levels. It feels really discouraging to make a budget when you’re not budgeting with real money in the first place and then also, just budgeting it takes a few months to learn and I don’t think I was prepared for the learning curve so I just continually felt like a failure where now, I always tell people that are trying to get started with budgeting because I did learn eventually. But I always tell people just give yourself three months, give yourself some time and just know it’s going to take some time to be able to accurately project what you’re going to spend and to not forget those things that haven’t come up mid-month. But I didn’t have that awareness to know that this is normal for this to be a challenge for you, it’s going to take you some time. [0:09:57] JH: Right and it’s something that is a work in progress. It requires a lot of flexibility because life happens, maybe there is a promotion, some more money, or maybe the opposite. Maybe there’s a decrease in income or maybe some big expense come up so you just have to be very flexible and that’s where people get frustrated, it’s not a stagnant situation but more of a fluctuating, I don’t know? A tool, system or however you want to call it. I think what people are foreseeing is set this up and everything will go fine but we’re human so we sometimes overspend or sometimes we forget that we pay, maybe we’ve been paying for a magazine subscription or whatever the case maybe that will throw off the budget. So yes, you’ve got to have the patience and you’ve got to be definitely be flexible with it. So I’m glad you stuck to it. [0:11:06] JH: And what would you say is the best money advice you’ve received? I know your dad started talking to you early on about investing and the power of compound interest and all that but tell me, was there any other advice that you would say is the best that you would receive? This is a personal belief but I think it does have implications financially as well. Being generous, no matter where you are financially does a lot for your mental outlook. I think it’s just easy to get this closed fisted if you’re in a hard place especially if you’re trying to pinch your pennies and it’s good to save and to be disciplined and to even sacrifice things that you might want. But I think giving even in those hard times flexes a different muscle that’s important to have. And so I think giving no matter what financial position we were in was huge for us just to keep a healthy positive attitude about money and as a Christian too, about God’s provision for us and so putting giving at the very top of our budget regardless of where we were, I think was probably the best, that someone mentioned that and told me to do that I think was the best advice I’ve ever gotten. [0:13:25] JH: Wonderful, I like that because it also gives you, especially in the tough times where you’re feeling so limited by the money and you’re feeling stuck, it gives you more, like you mentioned, it definitely allows you to use another muscle but it also gives you that feeling of you’re giving but also the abundance. There is a factor of abundance in there, so I think that’s wonderful. [0:13:56] JV: That’s absolutely right and one quick follow up to that will be, I think it also helps encourage your gratitude because even if you’re in a difficult place, you still can remember, “Well we do have something and we do have more than a lot of people and we can be grateful for what we have even if it’s not a lot.” And I think giving really helps encourage that sense of gratitude. [0:14:22] JH: Absolutely, absolutely. And what would you say is your favorite money quote? [0:14:41] JV: And that hit really close to home because of those months of sort of at the end of the month looking and figuring out where the money went and realizing how much further it could go if we actually told it where to go instead of wondering where it went. [0:14:56] JH: Right, right, right. That’s a great quote and you’re married so are you the money manager in the home or is it your husband? [0:15:06] JV: We both are. I think I do a lot of the administrative work on it so I’m the one to write out the budget each month and to keep track of it throughout the month and to pay most of the bills. Actually, it’s so great now so many bills can be automated. [0:15:26] JV: But I’m kind of the one to press send or to do the actual administration of the money but we do sit down every month and talk about it together. So I’ll have done the work to bring it to him and say, “Here’s how last month ended up. Here’s where we are savings wise and here’s what I’m proposing for this months,” and at this point, he’ll tell me and hopefully, this is happening before the very beginning of the month and we’re not already mid-way in, which happens sometimes. Or, “Maybe we should spend less on such and such,” or something like that. But then we come to a verbal agreement and go through and edit the budget and then after we talk about it, that’s the budget we both agree on for the month. [0:16:40] JH: That’s great and you both being able to have that money conversation is a beautiful thing because of course, that’s one of the toughest things to have that money conversation between a husband and a wife. A lot of people have such a hard time with that but you all do that on a monthly basis so I applaud you. [0:17:00] JV: Well, thank you and I mean that’s something else I would give as advise to other people and to try to do that monthly but we took a long time to get there. So we’ll have been married for seven years this month. [0:17:15] JV: Thank you and there were years that we didn’t really talk about money or was always a tense subject when we did. It didn’t just happen. We didn’t come into our marriage like that. It was something we’ve had to really work at. [0:17:33] JH: Right but you worked at it and it’s working so now, you’re having those conversations so that’s great. So you do the budgeting, you meet with your husband and have a conversation around the finances about once a month. Tell us a little more as far as are you more of a spreadsheet type of person? Do you still use Mint or maybe you do more a little bit of paper and pencil? Tell me a little bit more about your system of how you manage your personal finances. [0:18:10] JV: Okay, sure. When we first got serious I would say about, “Okay, we’re actually going to make this budgeting work”, I had been using Mint as I mentioned and to not a lot of success. At that point, I start using a pencil and paper so that when I did have to make edits, I could erase it mid-way through the month. I could say, “Well, we’re going to have to up this budget category and take this one down because I didn’t see that coming,” or whatever it was. Just because to get in the habit, it really helped me to just simplify it down to say, “I could do this with just a pencil and paper” and I used our bank account statements and things like that at that point. Then after we got in the habit of doing that and it was working, I got tired of hand copying things every month because a lot of the items are the same. You’re always going to have rent, you’re always going to have insurance, you’re always going to have groceries or whatever and so then I thought, “Okay, I think I’m ready to try a spreadsheet”. Now, what we do is we started doing then and what we continued to do is in my Google Drive, I use a spreadsheet which is very similar to an excel spreadsheet or something like that. It’s very simple, it has the budget categories like groceries or whatever it might be and then it has the target which is when we set our budget, this is what it’s going to be, the actual column because we still don’t hit it perfectly every month and then over on the side, I have keeping track of our incomes. When I set the budget every month, that target column adds up to the same amount as what the income is going to add up to. Then, I do use Mint though. So Mint does have a budget feature but since the spreadsheet thing was working for me, I just stuck with that. So you can set a budget in Mint and then check in and see throughout the month where you are on your different budgets but it just became important to me to make a new budget every single month because categories aren’t always the same. You might spend nothing one month on a category or something that comes up every six months or it might be a category that’s only for that one month or something. And so I found that with Mint, it’s really easy to set up budgets but if they’re changing frequently, it’s hard to go in. Or it’s just I didn’t want to have keep going in and changing them all the time. Or forget to change it and then be off, so I use Mint just to keep track of the categories because it does automatically categorize things for you which is really helpful. I have my old budget from however long ago that I set up in there but none of the numbers are accurate. It’s just a way for me to look quickly and see the different categories but then I take those and put them onto my own spreadsheet. As I’m saying it, it might sound more complicated than it needs to be to people listening but it’s actually very simple and it really works a lot better for me and is more straight forward to me than having to worry about the budget numbers changing every month in Mint. [0:21:36] JH: Right and sometimes you have to find, you have to try things out and find what works best for you for your personality for how you do things because it may not be the spreadsheet, it might be the software. It may be just paper and pencil, so it’s just a matter and I’m glad you’ve mentioned all three. [0:21:59] JH: And certain things that you liked about the different methods. You like the pencil and paper because you’re able to easily erase and those type of things so you just have to try things and see what works best for you, that’s awesome and what would you say is your proudest money moment? [0:22:25] JV: Well, it would definitely be paying off all of my husband’s student loan debt which has been just about a year. It was last September- October. [0:22:39] JH: Congratulations, I would definitely want to hear this. [0:22:42] JV: I really should know the date because I’m sitting here thinking, I don’t know this date by heart but it was such a long time coming at that point. It was like, “Let’s just get this over with,” you know? But yes, I mentioned that when we were married, we were using student loans to live on. We have been fortunate that a lot of my husband’s tuition over the years have been waved. It could have been a lot worst in some ways but he had gone to PhD and years and years and years of school and so we moved to Charleston about four years ago and for his first real job teaching in a college and it was at that point that we have been treading water for a couple of years before that because I worked and we could pay all our bills without the student loan at that point before we moved here. So we had been treading water, it’s not like we were going deeper and deeper but we just kind of put it in our minds because we couldn’t really do anything to pay it back yet and then once we moved here, he got that job and our income increased and we were going to have to start paying it back because he was out of school. So that was when we really got serious and I think really looked it in the face for the first time. Which was difficult because it was so much worse than I thought. And we had also made the — I’m not going to say a stupid decision, I would have done something different now looking back but we had made the decision to buy a car when we moved here and so we had just taken out this car loan and so that added this extra $10,000 onto our pile of student loans. In total with the car loan and then everything from the student loans that we owed was about $75,000 in debt and so that was just a staggering number to look at because here we were earning more money than we’d ever earned but also realizing even just the minimum payment on that was going to be just this huge chunk every month from our income. So that’s when I learned how to really do a budget for real and started with the paper and pencil, that’s about three and a half or four years ago and then I thought it was going to take five years minimum because just looking at it, to give you an idea of where we were, the first month that we started to try to pay a little extra on our debt. So we were always paying our minimums. In like a terrible situation I guess, but we were only able to pay an extra $100 towards our car that month and it was really exciting because it was like the first extra payment we were going to be able to make and it was the last day of 2011 that we did that but it was also a little discouraging because when you look at a $100 out of $75,000, that’s like a drop in the bucket. [0:26:04] JH: But overtime, it makes a difference. [0:26:07] JV: It does and what we found was as we got more proficient at budgeting, as we became more willing to sacrifice things from our lifestyle to become debt free and as we really looked for extra opportunities to make some extra money here, to do an extra project there, we were able to pay bigger chunks. So if we had only been able to be $100 a month every month, that might have been a little discouraging but things just seem to work out in your favor when you have that focus. Even just making a budget, you find money or it seems that you have more money than you used to seem like you have because you’re being more intentional with it and work hardly with it. We found as we grew in our skill set of budgeting and as we looked for more opportunities and all of that, we were able to pay bigger and bigger chunks toward our debt. It ended up taking us two years and 10 months to become debt free instead of five or more like thought it would. [0:27:19] JH: Right, well that’s beautiful and congrats. So basically, you buckled down and learned — in recap, I just want to make sure I got it. You buckled down, you learned how to budget effectively, you looked for other ways to make extra income and you also looked for ways to decrease what you were spending and then you tackled on what you could for the extra payments, would that sum it up on how you did it? [0:27:54] JV: Yeah, pretty much and some of the things would be maybe considered ill advised to some people but I think it was worthwhile for the focus it gave us because we have a small buffer of savings but we didn’t actively save. So we have a little buffer so that if something crazy happened like our car broke or things like that then we had money to repair it. But we didn’t try to save simultaneously as we were paying off debt. We really tried to put everything we could towards debt and the reason being we were paying so much interest on that debt that we wanted it to be gone as quickly as we could. And now that we’ve been debt free, we are actively saving a lot and we are able to save at such a bigger level now than we could back then. I know that some people don’t agree with that but I think just the focus that it gave us and also the feeling that we really want to be saving money and we need to hurry up and get this over with so that we can start saving money, gave some urgency to it. [0:29:03] JH: Absolutely, that’s why personal finances personal is different to every person and I know there are different ways of doing things paying off that whether it’s tackling the biggest interest or the smallest amount of debt, there are so many different ways of doing it but you really have to look at your personal situation what’s going to give you the push and the motivation to get it done? Because how the experts are telling you to do it, the gurus are telling you to do it may not be the best thing for you. They don’t know your personal situation in and out like you do. I think it’s good that you listened to yourselves and did how you did it because how you did it worked out perfectly for you and that is great. I appreciate your sharing that because that’s a big amount that you paid off. You did it in over two years and how you did it is fabulous so I congratulate you again. [0:30:12] JV: Well, thank you so much. Yeah, we feel very grateful and that there were a lot of things along the way that we couldn’t necessarily take credit for that we were just thankful to get to benefit from. [0:30:28] JH: Got it, got it. Well I appreciate you sharing that and Jacey, you know this podcast is about making money simple and taking control of it so how would you finish this sentence, Her Money Matters because ______. [0:30:43] JV: I would say, Her Money Matters because it is empowering and — wait. Can I just clarify? [0:30:59] JH: Sure, absolutely. Go for it. [0:31:09] JH: Her Money as in the general female but it can be in general because money has definitely no gender. [0:31:16] JV: Yeah, right. Okay, good, alright. Okay, I would say Her Money Matters because it is such a huge part of our lives whether we like it or not that learning how to be proficient and grateful and generous with money is just so empowering and so freeing that it’s important to take the time to learn and to, I keep wanting to say invest but I know it’s kind of a pun but to invest in learning how to handle money for yourself. [0:32:06] JH: That’s awesome. I like that. Well Jacey, I really appreciate you being here. Tell us where is the best place where people can find you and learn more about you? [0:32:16] JV: Okay, I would say since this is a podcast, I will direct you listeners to my podcast website which is Aroundthetablepodcast.com. I would certainly invite everyone to join us Around the Table if you are enjoying this podcast and are looking for anymore to add to your roster. My personal website is thebalancedwife.com, that’s more about me but certainly, check out the podcast. [0:32:51] JH: Awesome. Well, I’ll be sure to link those up to the show notes and Jacey, thanks again for being here. It was a pleasure in just getting to know you and your money story and you sharing all the insights you had. [0:33:04] JV: Well thank you so much for having me. [0:33:06] JH: I appreciate you, thank you. [0:33:09] JH: Well that was such a great chat with Jacey and I hope that you got a lot of great value out of this interview like I did. I think for me the biggest takeaway was her journey on budgeting just basically because it confirms what I keep saying to really make sure you look for something that works for you and listen to your intuition on actually what works for you and what doesn’t. So in her journey, she started with Mint, she ditched it, she went to the pencil and paper method, then she got tired of writing the same things over as far as the categories and so forth, she just went to simple spreadsheet on Google Drive and she mentioned how simple it was and then refers to Mint as necessary just for the different categories. So the point being here that after disappointments of breaking the budget where she said she did, she stuck with it. She may have changed the tools but she found a way that makes it work for them. She didn’t give up, she just found tools where she mentioned, she would use more than one tool. She uses the spreadsheet but she also uses Mint for certain things. You’ve got to make sure that it works for you so I definitely encourage you to do the same and as you have heard before, I like to refer the budget as more of a money plan especially because you’re planning how you’re going to spend your money. It makes more sense for me and it just easier on the ears rather than the word budget which feels so constrictive. If you like softwares and that’s something that you like, you’re more on the smart phone or looking at apps, I definitely recommend mint.com which is a free app and you can also go in your computer. Or there is a paid software that I also recommend which is YNAB, so why you need a budget. YNAB for budgets which has a onetime cost. For spreadsheets, there are so many to choose from. I know I have one that my clients have loved and have created which I’ll share in a moment how you can get your hands on this if you haven’t done it already because I know there’s been those that have and if you like writing things out, you don’t have to copy things over, you’re more of a pencil and paper type of person. I just suggest create in a Word document and just print it out month after month or make copies of it so that way, you’re not writing down the same categories or you’re just writing down the numbers that have changed and fluctuated. If you don’t want to start from scratch, I have a solution for you. In my money kit combo, I created a money template, a downloadable PDF to print out. I do want to challenge you to something today because I know with budgeting, that’s a frustration that many, many people have. I don’t think I’ve encountered one person that has never had a frustration with budgets. It’s very, very common so I challenge you to reflect on the times that you started a budget and didn’t work and ask yourself why it didn’t work? Was it the actual tool that you didn’t like, was it maybe fear, was it not knowing what you were doing, was it overwhelmed, what was it that made it not work? Was it maybe you overspent and that frustrated you? What exactly? So make sure you take some time and I challenge you to do this. It’s really important and make sure you take some time to reflect. Write it down, be honest with yourself and be specific. There’s no reason to get scared of the answer. This reflection, the only thing that it’s going to do is really going to help you. And that is a wrap for today. I want to thank Jacey for joining us and sharing all the goodness that she shared. You can check out the show notes to find where to find Jacey and the links that I just mentioned just now at jenhemphill.com/31. 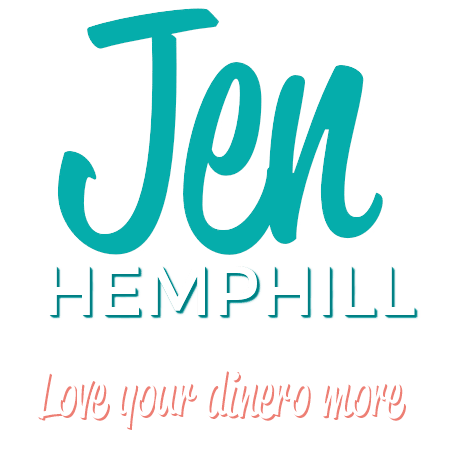 That is Jenhemphill.com/31. Thanks again for joining me today and we will see you again next week on Thursday.